The Dymotec 6 is a high quality moderately priced 6 volt sidewall dynamo, perfect for the rider who occasionally needs light at night. 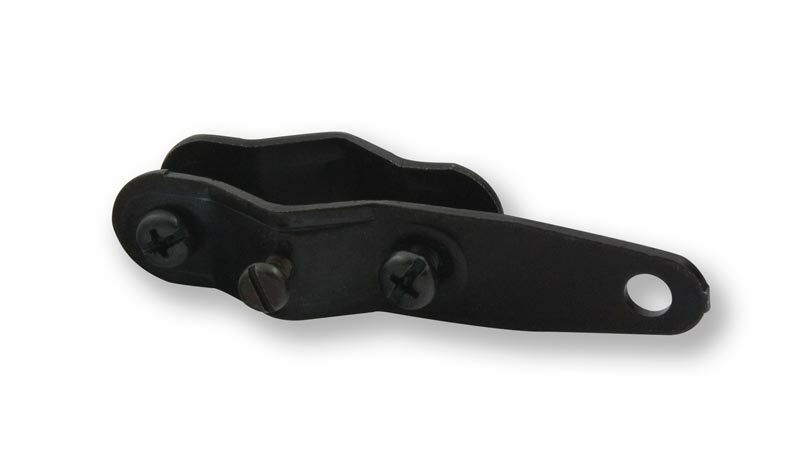 We have these in stock; both left side and right side mounting. The Dymotec 6 is very reliable and a good choice for riders with a short commute or limited budget. Available for either right or left side mounting. I use this on my Bridgestone MB-0 for zipping around town at night. The Dymotec 6 will power either a halogen headlight with a 2.4 watt bulb and a taillight with a .6 watt bulb for a total of 3 watts, or it can power a single halogen headlight with a 3 watt bulb. It can also power any 6 volt LED headlight I sell, with or without a taillight attached. Since the dynamo itself acts as the on/off "switch", you can use headlights without a switch, saving some money. For riding in the rain, I recommend using the wire roller which as available as a small part. It attaches to the Dymotec 6 easily in a few seconds, just remove the rubber roller and install the wire roller. And don't forget you'll need a mount. See the spare parts list below. The Dymotec S6 and S12 have been discontinued. The S6 was a much more expensive dynamo with special electronics to reduce drag, such as was also used in the discontinued 12 volt S12. If you own a Dymotec S6, and you are considering the purchase of a new headlight, be aware that the S6 is not compatible with any of the Busch & Müller IQ type LED headlights. It is compatible with the DLumotec series headlights, such as the DLumotec Oval Plus and DLumotec Topal. Since the Dymotec S6 was discontinued before the IQ lights became available, the IQ lights were never designed for compatibility with the S6. So, if you have the Dymotec S6 and want to use an LED headlight, I recommend the DLumotec headlights, if you can find one. They have been discontinued for several years. I have not tested the S6 with any other LED headlights such as the Supernova, Inoled or Schmidt Edelux. And I no longer have an S6 available to run such a test. But the DLumotec Oval Plus works beautifully with the S6 and you can use it with confidence. The wire roller is highly recommended for use in the rain, but does require precise alignment to avoid damaging the tire's sidewall. With the standard rubber roller, the dynamo's alignment is still critical. Not only will it increase the drag, it will result in the roller wearing out quickly. It makes sense to order an extra roller when you order any sidewall dynamo. Unless you alrady have a generator mount brazed onto your fork, you won't be able to use these generators on the front of your bike. But if your frame is made of steel, aluminum, or titanium, you can mount the Dymotec on the seat stay of your frame with the Dynamohalter mount. Not recommended for carbon fiber frames, since the Dynamohalter mount uses a set screw that presses into the frame a bit to keep the mount from rotating around the frame tube. The headlights for these dynamos do not require a switch since the system is turned on by moving the dynamo to contact the tire. By the way, it's that movement that determines whether a dynamo is right sided or left sided. So the more expensive switched Lumotec headlights that I sell for hub dynamos like the Schmidt SON are not needed. I stock many 6 volt halogen Busch & Müller headlights along with the Schmidt E6 6 volt headlight without switch for use with the Dymotec 6 generator, or any 6 volt tire driven dynamo. And we also have several headlights from Busch & Müller using an LED for extremely long life. I stock a 12 volt headlight and two 12 volt taillights for use with the Dymotec S12. All sidewall dynamos can only be used with a single headlight. You cannot run two headlights from a sidewall dynamo. And with the Dymotec 6, you have the option of using a taillight wired to the dynamo, or just using battery powered taillights. The S12 must have a taillight attached. All of the headlights I sell have circuitry to protect the bulb from burn-out at high speeds. All 6 volt halogen headlights ship to me with a 2.4 watt bulb installed, and are intended to be used with a .6 watt taillight. A 3 watt bulb is optional for the 6 volt headlights when used without a taillight. The 12 volt headlight ships with a 5 watt bulb. 5 watt bulbs cannot be used in a 6 volt headlight. 2.4 or 3 watt bulbs cannot be used in a 12 volt headlight. The LED headlights can be used with or without a taillight connected, and no changes are needed at the headlight. However, for the LED to last as long as possible, it needs to run cool, and to run cool a taillight should be connected. So I highly recommend use of a wired taillight with the LED headlights. 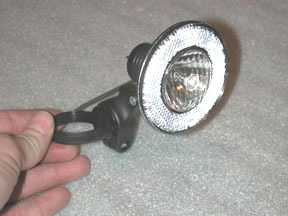 Lumotec (6 volt) headlight for use with Dymotec 6 (round). Comes with single strand 185cm wire and connectors. Compatible with any 6 volt tire driven dynamo, including the discontinued Dymotec S6. 2.4 watt halogen bulb is standard. A reflector surrounds the lens for added safety. Add $2 to change to a 3 watt bulb. No brackets are provided with the round Lumotec headlights, but are sold separately. We have replacement lenses for the Lumotec. We used to sell the Lumotec Plus, which has a standlight. It uses a slightly different lens to accomodate the standlight's LED. We still have replacement lenses for the Lumotec Plus in stock. FYI: You can't convert a Lumotec into Lumotec Plus just by changing the lens. 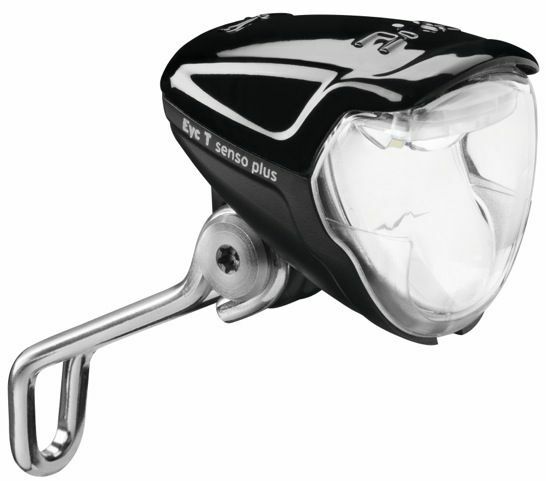 For the most tightly focused beam of any bicycle headlight, choose the Schmidt E6B-OS. By concentrating the light, these place more light further down the road which is helpful at high speeds. Some people will prefer a larger patch of light on the road, so a wider beam such as the Lumotec and Lumotec Oval (above) may be preferable. Also, see the new Busch & Müller LED headlights below. This is the Schmidt E6-OS headlight. The optics are the same as the BiSy, but it is easier to replace a bulb and is more ruggedly constructed. The E6 does not come with wiring or connectors. You need to purchase those separately. See below. Compatible with any 6 volt tire driven dynamo, including the discontinued Dymotec S6. The Lumotec Eyc is new for 2014. The beam is the same width as the original Lumotec CYO with better nearfield illumination. 50 lux is all the light most people will need. 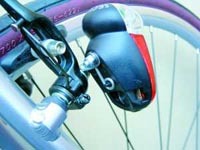 The photo shows the T Senso version which is for hub dynamos. The version for the Dymotec 6 says Eyc Plus on the side. There has never been a headlight this good for a tire driven dynamo. Not compatible with the older Dymotec S6 dynamo! However, works perfectly with the Dymotec 6. The Lumotec LYT Plus is a very good headlight for the urban commuter who rides at moderate speeds in urban areas with overhead lighting. So this headlight is mostly for seeing road debris and for others to see that you're there, not for riding on hilly rural roads. Includes a standlight for waiting at those pesky traffic lights. Ships with the mount in the photo. All dynamo powered taillights are steady-on taillights. They have no flashing mode, unlike many battery taillights, since flashing taillights are illegal in Germany, where these lights are made. And for group riding, such as brevets, flashing lights can be quite annoying for riders behind you. All Busch & Müller taillights, whether battery powered or dynamo powered have built in reflectors, for added safety in the event of wire or battery failure. The rack mount taillights all mount to a horizontal bracket with two holes either 50mm or 80mm apart. 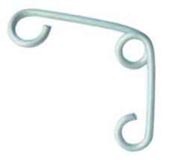 I sell these brackets for $ 6.00 to mount on racks without suitable mounts. The Tubus Cargo and Logo racks incorporate the proper mount for these lights. Fender mount taillights require two holes drilled in the rear fender. The holes should be 5mm in diameter, one above the other, 20mm apart. Care should be taken to mount the light so that the brightest part of the beam is at driver's eye level. Where you mount the light along the curve of the fender determines where the beam is aimed. Seculite Plus (6 volt) taillight for rear fender mounting. Wiring not included. The LED light is in the top clear section. The LED glows red. The reflector is below. For more information about Lumotec headlights, go to the Busch & Müller home page. The Lumotec Oval and Oval Plus (both 6 volt and 12 volt versions) come with brackets for caliper brake and cantilever brake mounting. Note the little set screw on the right side. That digs into the seat stay just a bit to prevent the bracket from rotating on the round frame tube. 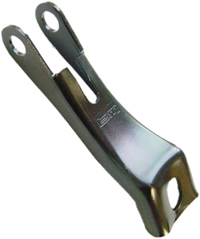 If you're not willing to have your frame's paint damaged a bit where the screw digs in, don't use this bracket. The bracket will not work properly without the set screw. Also, don't use this on a carbon fiber frame. This mount is made with commuting bikes in mind, not ultra lightweight racing bikes. I recently had a report from a customer who used this on an older steel racing frame, which apparently had been built with very thin tubing. The Dynamohalter crushed the seat stay. The two outside bolts should not have to be tightened with all of your strength to get the dynamo mounted securely. 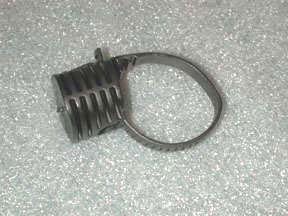 You must depend on the set screw to keep the Dynamohalter from moving on the round bicycle tube. Even the heavier tubing used on touring bikes can be crushed if you try to completely secure the Dynamohalter by the two outer bolts. And if your frame is a very light racing frame, be extra cautious. The Dynamohalter will not work on tubing larger than 20mm in diameter! And it won't work on any fork I know of. Use this only if you can't use the Dynamohalter mount on the seat stay. The Dynamohalter is stiffer, so it will hold the dynamo in place more rigidly. Every dynamo comes with wire, as does every Busch & Müller headlight. The exceptions are the dynamo powered taillights, battery powered taillights, and the Schmidt E6B-OS headlights. We sell wiring separately, so you can carry a spare wire, or connect an E6. We have a single strand wire without connectors, single strand wire with a connector on one end, and we have a double strand wire with connectors on one end. The single strand wire works if you can use the frame to carry the ground. But many bikes won't conduct ground through the frame for a variety of reasons. For those bikes, we have the double strand wire; one side for power, and the other side for ground. On some bikes, you don't need to run two wires from the dynamo to the lights. The dynamo can be grounded to the frame through its mount. Headlights and taillights can often get their ground connection through the frame. So often a single wire to the headlight and then to the taillight is all you need. But there are some situations where you won't be able to do this. For instance, if you mount the dynamo on the front fork via the Dynashoe mount, the ground link would have to pass through the headset. With most headsets that's fine. But some headsets will not pass electrical current through them. Shimano cartridge bearing headsets, for instance, won't allow you to do this because the material used in the cartridges is an electrical insulator. If you mount your headlight with either my custom handlebar mount or the R&M handlebar mount, it will not be grounded to the frame, and you will have to run a second wire. But that wire doesn't necessarily have to extend all the way to the dynamo. You could run a short wire to a metal part on the bike, like a brake bolt, and pick up ground from there. If you have a tandem, you'll need a longer wire than 185cm to reach from the front of the bike to the rear. We have a long spool of wire that we can cut any length you might need from, and then you just need some connectors. Loose wire costs $.25 per foot. Cross Bracket for mounting Seculite Plus or Seculite Plus 12 to a rear cantilever brake stud. Since the 4DLite Plus and the Spanninga are heavier than the Seculite Plus, I don't recommend using them with the Cross Bracket. For a full list of available light brackets, see the Light Mounts page. Stainless steel wire roller for Dymotec 6, and S12. This roller won't slip in the rain. Take care in aligning the dynamo when the wire roller is used. The wire roller can wear out the tire's sidewall quickly if it's not properly aligned. You want the roller "rolling" not "scrubbing" on the tire. Rubber roller for Dymotec 6, and S12. Included with all Dymotec dynamos. The new R&M handlebar mount is longer to place the headlight below the top of the handlebar. Front view of a Lumotec, mounted on my handlebar bracket, mounted on the NOB, held by fingers. Fingers are available separately. Sorry, but I do not sell spare parts for other brands of sidewall dynamos. See the Light Mounts page for a complete list of available mounts. We have many more mounts than what you see listed here. Busch & Müller used to make a high quality 12 volt sidewall dynamo, the Dymotec S12. It has been discontinued and are all gone. 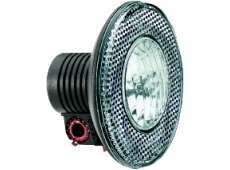 However, we still stock a few lights for these dynamos. 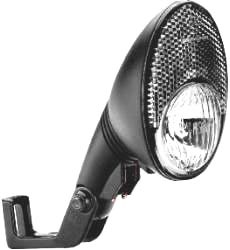 Lumotec Oval Plus 12 (12 volt) headlight and brackets for use with Dymotec S12 generators. Comes with single strand 185cm wire and connectors. Available now. The Oval Plus 12 looks identical to the 6 volt version, seen below. DToplight Plus 12 (12 volt) taillight for rear rack mounting. Use only with the Dymotec S12 dynamo. Available now: Wiring not included. Seculite Plus (12 volt) taillight for rear fender mounting. Wiring not included. Available now. Looks identical to the 6 volt Seculite Plus. Scroll down this page for more small parts. But what about these new LED headlights? In the past few years, significant advances have been made in LED headlights. The newest designs are significantly brighter than older LED lights, and even brighter than the best 6 volt halogen systems. In fact, some are even brighter than the 12 volt Lumotec Oval Plus 12 made for the Dymotec 12. So why would anyone buy the Dymotec S12? The light from an LED has a slight blue tint to it. Side by side with a halogen beam, the halogen beam looks more yellow. And for many cyclists, particularly some of us old gezers, the yellowish beam is more useful. We can see more detail than we can with the bluish tinted light from the LED. The Busch & Mueller S12 must be used with both a headlight and one of the 12 volt taillights I've listed below. Unlike the Dymotec 6, there is no viable option for running the S12 with a headlight only. The taillight must be wired to the headlight. If not, the headlight bulb will burn out quickly. People frequently ask if their 6 volt Dymotecs and 6 volt lights can be upgraded to the 12 volt specifications. Unfortunately, this is not possible. Electronic overvoltage protection in all of the 6 volt lights will fail if powered by the S12. If your fork doesn't have a dynamo mount built in, you will have to use the Dynamohalter bracket mounted on one of the seat stays. You can mount it on either the right side or the left side. Don't use the Dynamohalter on a carbon fiber frame. You need to buy the dynamo for the side of the bike you want to put it on. There's a different version for right or left side mounting, and you can't change it. You either buy a right side version, or a left side version. Then you need to decide where you'd like to mount the headlight. You can mount the headlight either at the fork crown, or on either fork blade, or up on your handlebar. I have mounts for putting the headlight directly over the front tire at the fork crown. Most bikes have a hole drilled in the fork crown and the bracket attaches with a bolt through that hole. If you don't have a hole there you can drill one. If you don't have a bolt to hold the bracket there, ask for one, since a bolt isn't included with the bracket for the connection to the frame. I usually have them available. If I don't, it's an easy part to get at any hardware store. 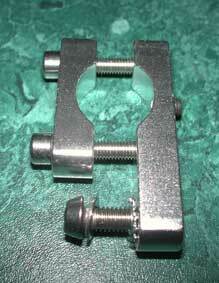 A bolt is included with each bracket for holding the headlight to the bracket. I also have mounts for putting the headlight directly on your handlebar. 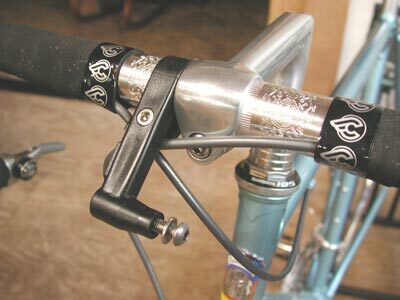 You also have the option of mounting a headlight on the side of your fork, using both my handlebar mount, and a handy little device called a Cronometro Nob. The Nob is intended for mounting a bicycle computer/speedometer on a triathlete type aero bar. It wraps around any tube and gives you a cylinder the same diameter as a handlebar. You mount the handlebar bracket onto the Cronometro Nob, and then attach the headlight to the handlebar mount. It sounds more complex than it is. See my page on this. Then you need to decide if you'll be using a taillight wired to the dynamo. If so, you'll use the standard 2.4 watt bulb included with every headlight from the manufacturer. 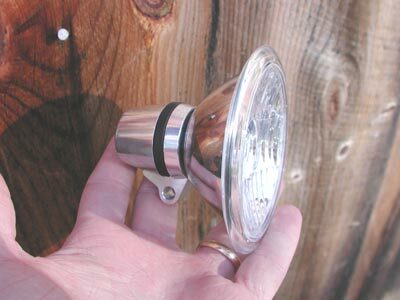 If you prefer to use a battery taillight, the bulb must be changed to a 3 watt bulb. All headlights are designed to have a 3 watt load. In Germany, where these are made, the law requires a headlight and a taillight. By law, the headlights are 2.4 watts, and the taillights are .6 watts. The circuitry in the headlights that prevents the bulb from burning out at high speed assumes a 3 watt load. So, if you would rather not run a wire to the back for a taillight and will use a battery taillight instead, you can't use the 2.4 watt bulb since it will burn out quickly. The 3 watt bulb isn't noticeably brighter than the 2.4 watt bulb, so don't decide on a battery taillight on that basis. If you choose a wired taillight, you have fender mount and rear rack mount types to choose from. The Seculite Plus fender mount taillight can also mount on a rear cantilever stud using the Cross bracket. I recommend both a wired taillight and a battery taillight. That way, if your batteries fail, the wired taillight acts as a backup. Should a wire be damaged somehow, the battery taillight is there as a backup. By the way, all dynamos come with wire. All headlights come with wire. But, not all taillights come with wire. So you may need to order wire separately for your taillight. On the other hand, please don't hesitate to call or email (telephone is best, see below) with any questions about using or setting up the Dymotecs with the lights I sell, or with any other lights meeting the German StVZO regulations, in other words, any lighting systems legal for sale in Germany, which pretty much sets the worldwide standards for bicycle lighting. I will respond as soon as possible to all such queries. For those who for whatever reason cannot use a taillight wired to the dynamo, a 3 watt bulb should be used in the 6 volt halogen headlights rather than the standard 2.4 watt bulb. The 3 watt bulb is not noticeably brighter than the 2.4 watt bulb. But since the overvoltage protection circuitry built into all of the halogen headlights I sell is designed for the 2.4 watt bulb together with the .6 watt taillight, (totaling 3 watts) if you eliminate the .6 watt taillight the bulb in the headlight will burn out quickly. Using a 3 watt bulb in the headlight puts the system back in balance, and gives you full run time on the bulb. For the 12 volt Dymotec S12, the only option is to use the system complete with a 5 watt headlight and 1.2 watt taillight. I have both fender mount and rack mount 12 volt taillights for the S12 dynamo. There is no higher wattage headlight option for the S12. Using the S12 with only a headlight will result in premature burnout of the 5 watt bulb. If your headlight is an LED type, like the DLumotec Oval N Plus for example, it's best if you have a taillight attached, as the LED in the headlight will run cooler and will last longer. The Lumotec IQ Fly and IQ CYO can be used with or without a taillight with no effect on the headlight's LED. For emergency use, any model Dymotec and associated lights should be all you need for safe riding after dark. But for extended use, I suggest you also have a small battery powered headlight and taillight as a backup. Although the Dymotecs have been extremely reliable, any mechanical device can fail, and if you're 5 miles from home in the dark, you'll be glad you have a backup light in the case of failure. Busch & Müller make terrific battery headlights and taillights. The Busch & Müller Freelite D has the same efficient beam pattern as the Lumotec and Lumotec Oval Plus, brighter on top than the bottom, giving even illumination both far and near. Replacement bulbs are in stock for the Freelite D. However, the best battery headlight available is the Ixon from Busch & Müller. The Busch & Müller Relite D is a very efficient battery taillight using LEDs. 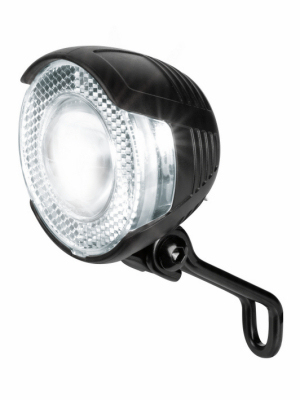 The Relite D has only a steady on mode, as it's designed to meet the German legal requirements for bicycle lighting, and those prohibit a flashing light. For riding in groups, flashing lights can be distracting to following riders. So the Relite D can be the perfect taillight for brevets. It also has a reflector, unlike many other taillights. 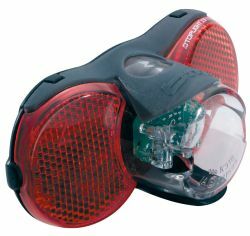 If you have a retail bicycle shop, or are a bicycle manufacturer, you can purchase Busch & Müller products, including dynamos, headlights, taillights, battery lights and mirrors at a discount for resale. Any shop in the US or Canada can purchase Busch & Müller products for sale in your store. Please call me for pricing. Peter White Cycles is an official representative for Busch & Müller the US and Canada, and we want all bicycle shops to be able to sell these products.